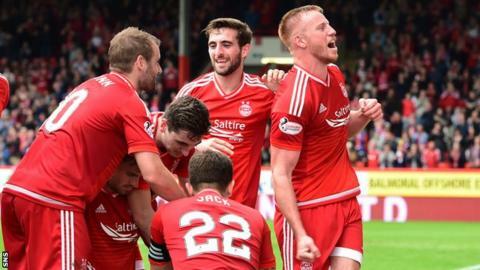 Aberdeen beat Dundee to continue their 100% start to their Scottish Premiership campaign thanks to two second half goals from Adam Rooney. The Dons dominated, but it took more than an hour to break the deadlock. The opener came from a header after good work on the right by Johnny Hayes who picked out Rooney with a cross. Number two arrived from the penalty spot after Rooney himself was brought down by Gary Harkins, who was shown a red card for the challenge. The win was only Aberdeen's third league success over the Dark Blues in 18 Pittodrie meetings. It is also the first since since the 1991-92 season that Aberdeen have started a league campaign with four consecutive wins. Willo Flood missed out for the Dons through injury while Thomas Konrad began the game for Dundee after Nicky Low failed to recover from a knock picked up in last weeks win over St Johnstone. The home side dominated the early part of the game and a new-look Dundee defence came under constant pressure. David Goodwillie nodded just wide of the target with Ash Taylor, Hayes and last seasons top scorer Rooney all coming close to an opener. Dundee struggled to get hold of the ball but when they did their passing went astray and allowed the home side to push forward. Rooney then had a header that clipped the top of the crossbar before Gary Harkins sent a header back across his own goal and just beyond the far post. On a rare venture forward by the visitors' Greg Stewart found his way to the edge of the 18-yard box, but Andrew Considine made a timely challenge to deny the visitors. Hayes and Ryan Jack were finding plenty of space in the midfield to drive forward at every opportunity, but Paul Hartley's side stood firm until the break. Dundee looked much improved after half-time and came close to the opening goal of the game. Stewart clipped a lovely ball over the Dons defence for Kane Hemmings, who was denied when one-on-one against goalkeeper Danny Ward, before Stewart himself tried an effort from distance with his left foot that was just the wrong side of the post. Hemmings then tried his luck with a looping header that Ward tracked back to grab under the crossbar. Just as it appeared the visitors were gaining control the Dons took the lead. Hayes' pace down the right-hand side took him away from Kevin Holt and the winger's pinpoint cross was met by Rooney who nodded the ball into the bottom corner. Graeme Shinnie connected with a Josh Parker cross but Dundee goalkeeper Scott Bain made a tremendous stop low to his left-hand side. However, in stoppage time the home side secured all three points when Harkins bundled over Rooney, who converted the penalty himself. Match ends, Aberdeen 2, Dundee 0. Second Half ends, Aberdeen 2, Dundee 0. Goal! Aberdeen 2, Dundee 0. Adam Rooney (Aberdeen) converts the penalty with a right footed shot to the bottom left corner. Gary Harkins (Dundee) is shown the red card. Penalty conceded by Gary Harkins (Dundee) after a foul in the penalty area. Penalty Aberdeen. Adam Rooney draws a foul in the penalty area. Attempt saved. Gary Harkins (Dundee) right footed shot from outside the box is saved in the centre of the goal. Nick Ross (Dundee) is shown the yellow card for a bad foul. Adam Rooney (Aberdeen) wins a free kick on the right wing. Substitution, Aberdeen. 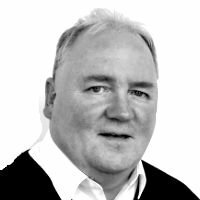 Paul Quinn replaces Jonny Hayes. Attempt saved. Graeme Shinnie (Aberdeen) right footed shot from the centre of the box is saved in the centre of the goal. Substitution, Dundee. Dylan Carreiro replaces Thomas Konrad. Attempt saved. Greg Stewart (Dundee) left footed shot from outside the box is saved in the centre of the goal. Substitution, Aberdeen. Josh Parker replaces David Goodwillie. Kevin Holt (Dundee) wins a free kick on the right wing. Nick Ross (Dundee) wins a free kick in the attacking half. Julen Etxabeguren Leanizbarrutia (Dundee) is shown the yellow card for a bad foul. Goal! Aberdeen 1, Dundee 0. Adam Rooney (Aberdeen) header from very close range to the bottom right corner. Assisted by Jonny Hayes.